Horizontal panels are created from stitching giving the headboard of this upholstered bed a unique look. 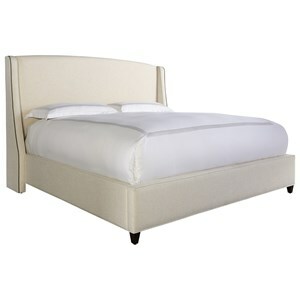 Add this king size bed to your master or guest bedroom for a stylish update. Also available in 60 inch height. The My Style - Beds Ivy Lane 60'' Upholstered King Bed by Rowe at Saugerties Furniture Mart in the Poughkeepsie, Kingston, and Albany, New York area. Product availability may vary. Contact us for the most current availability on this product. The My Style - Beds collection is a great option if you are looking for Contemporary Traditional furniture in the Poughkeepsie, Kingston, and Albany, New York area. Browse other items in the My Style - Beds collection from Saugerties Furniture Mart in the Poughkeepsie, Kingston, and Albany, New York area.